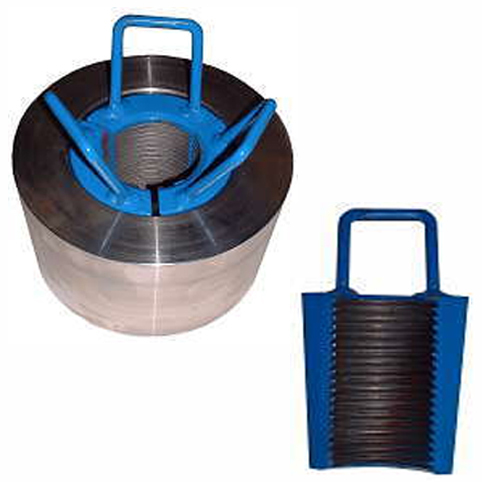 Bowls and Slips are designed to prevent the drill rod or casing string from slipping back down into the borehole as it is being pulled out of the ground. The slips are externally tapered and furnished internally with case-hardened serrations for gripping the drill string. These slide into a bowl which has a matching internal taper. The weight of the drill string forces the slips to slide downwards in the bowl, thus tightening around the rods or casing and preventing them from slipping. Several sizes of slips may be used in a single sized bowl. To increase the range of sizes that one bowl can accommodate, a reducing bowl may be used inside the larger bowl.